Hand out some Jumbo paper clips with logo and you'll be absolutely amazed at the exposure made possible for your Company! Just attach the promotional paper clip to a document, invoice or order, and hand out to ensure your customer reuses the clip later on. 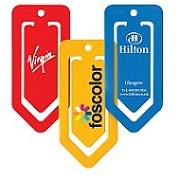 Personalised with your Company brand name and logo in a 1 colour print, you can rest assured that by handing out Jumbo paper clips with logo you will gain some solid customers and good retention of your branding, aswell as providing a useful business gift. For a FREE QUOTE, please fill in the form regarding our Jumbo paper clips with logo and we'll be able to help you.